The below quote from Magpul sums up AR pistol grips better than I could ever hope too. THE PISTOL GRIP IS ONE OF THE MOST IMPORTANT INTERFACES BETWEEN MAN AND MACHINE, MAKING THE “RIGHT”GRIP PREFERENCE A VERY PERSONAL THING. Being an old guy I’m allowed to say I remember when the only aftermarket AR pistol grip available was called a replacement part. Those were the days before the internet and the shotgun news or guns and ammo magazine were the primary resource for new product information. Those were also the days I drooled over owning an AR-10 or Panther Arms .308 AR. I think the first aftermarket pistol grips I remember noticing were Ergo/Hogue palm shelf style. I cant say for sure if those were the brands though. 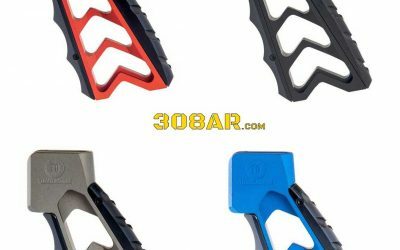 Fast forward nearly 30 years and AR shooters put nearly as much thought into selecting the best pistol grip for their use as they do selecting any other AR part. 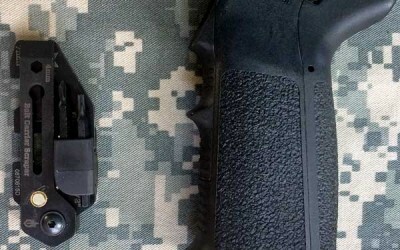 Today as an example you can find a vast array of AR pistol grips from Magpul. You can select from a multitude of colors, textures thicknesses and surface textures. Some feature grip storage and even replaceable back straps. Other companies offer exotic wood, tacky rubber or even CNC machined aluminum either anodized or cerakoted in colors and patterns nobody would have imagined a decade ago. 1. Make sure weapon is unloaded. 2. Remove upper from weapon and turn receiver upside-down. 3. Using armory guidelines, remove existing grip from weapon making sure not to loose selector spring that will be exposed when grip is removed. 4. Slide pistol grip onto lower receiver making sure selector spring engages in the hole on the right hand side of the grip without binding. 5. Using a flathead screwdriver install the supplied panhead screw in the forward most hole and hand tighten into receiver. NOTE: The rear hole on the top of the grip is used for clearance when using the bolt and firing pin core. 6. Test function of selector and general function after installation prior to test firing. 7. Test fire the weapon prior to use in operational environments.